To genealogists, cemeteries are repositories of much more than bodies. In fact, cemeteries may hold information on tombstones and in sexton records (if we’re really lucky) that gives us parents’ names and dates of birth and death or other details on those buried there. To get the most out of a trip to an ancestral cemetery, one needs a little bit of “cemetery savvy” which I described in a posting of Feb22, 2012. I covered points such as at-home preparation through studying websites and calling the cemetery or sexton’s office for information. This communication may help you learn a lot about exactly where your ancestor is buried and if there are any burial cards available to tell who bought the grave lot. Also in that posting, I linked to a website which gives instructions on the do’s and don’ts of tombstone cleaning. 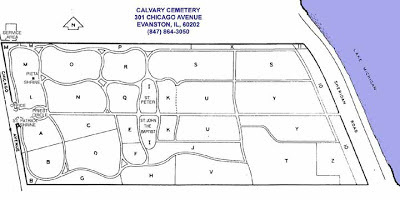 Before I came to Chicago on my September 2012 research trip, I had found a map of Calvary Cemetery online, and I had talked a few times with both members of the staff, John F. Geary and Thomas J. Berry. I called before I left to let them know I was coming. Also I was fortunate to have met Craig Pfannkuche, a genealogist steeped in Chicago history, through the Newberry Library’s listing of Chicago area researchers. Craig had done some on-the-ground research for me in Chicago records a few years ago. Now it was my opportunity to meet him in person. As a true lover of Chicago and its rich past, Craig offered to be my guide to Calvary and any other place in the city. Well, the big day finally came. I was so excited to be standing in front of the Calvary Cemetery Office, wearing my backpack filled with tombstone cleaning supplies. So many times I had pictured myself right here, at the edge of the cemetery, ready to find the grave of Patrick William Kearney, the brother of my great grandmother, Mary Kearney Kries Lauer. Our first step was to say hello to Tom Berry who was on duty the morning of our visit. He directed Craig, my husband Bert, and me to the kiosk which houses a computer database that gives grave location information. 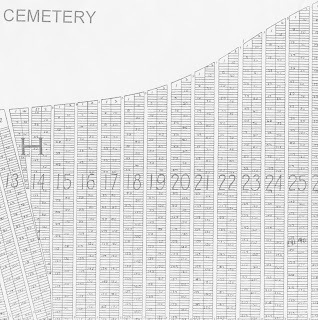 All you have to do is key in your ancestor’s name, and a cemetery map comes up with a diagram of the grave location for this person. I put in the name of Patrick William Kearney and printed out the map. 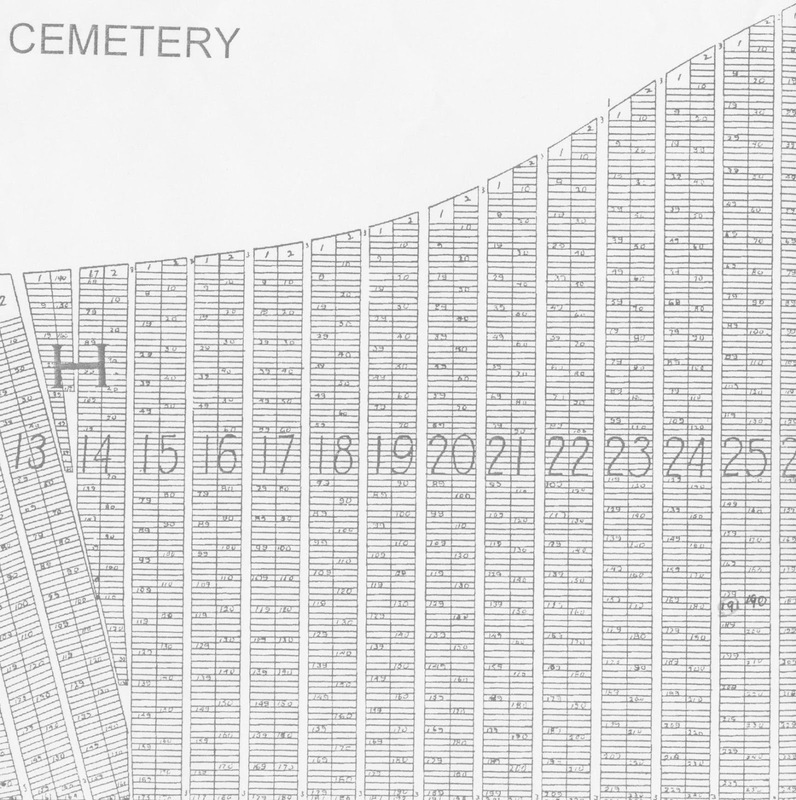 Then we headed to Section H, Block 25, Lot 191.
image of Section H, Craig was able to identify Block 25, Lot 191. For the first time in 133 years, someone had come to honor the memory of two-year old Patrick William Kearney. Only after I left Chicago and returned home did I realize that I wanted to check into putting a monument on Patrick’s grave. More about this in a future posting. Our next stop was to visit the grave site of the Sweeney/Brookins/Dinan family, a collateral group in the Kearney/Carney network of friends, associates and neighbors. It took a little longer to find the family plot as there were so many tombstones in Section U, Lot S18. Unfortunately there was only one marker for this group of eleven family members. Craig was on his knees, busily pulling aside grass and brushing dirt away so that we could more easily read the marker. At last, we could make out the inscription: Ida M. Schuerman and Walter C. Schuerman. I believe that Ida was the granddaughter of Catherine Sweeney Brookins Dinan. Catherine was one of the baptismal sponsors, along with her son Charles Dinan, for my great grandmother’s first child, Henrietta Kreis. of the cemetery who had given me much information over the years before my visit. 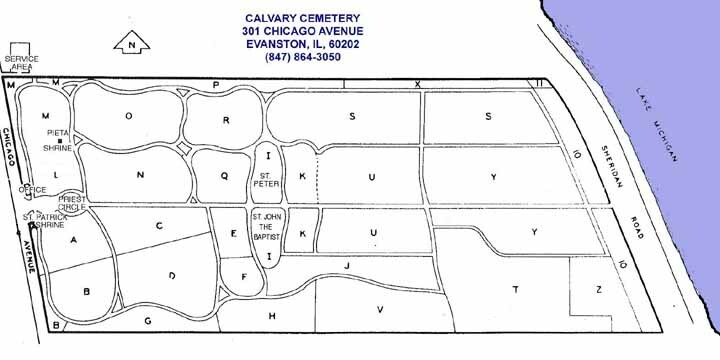 We had printed out maps from a new technology -- the kiosk -- available at Chicago Catholic cemeteries. Using the maps, we had found one unmarked grave for an ancestor and a marked grave for a collateral family member. And best of all, I had reaped the benefits of having a local person, Craig, show us around the cemetery.